Every day, new audiences attend performing arts events. And many of them open their programs only to find program notes written for patrons with a much deeper understanding of the art form, the work, its context, etc. If you knew that a new patron was attending your event, what would you tell them to guide them toward a positive experience? 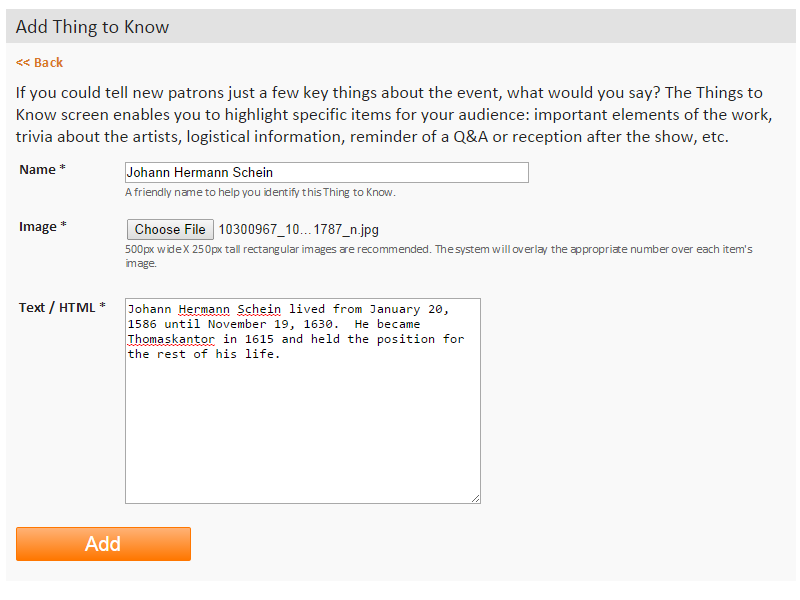 This is the thought that prompted us to develop Things To Know – a new feature in the At The Event module for the mobile suite. Things to Know is a list of short, interesting, and useful facts related to the event. These can range from trivia about the programming or people involved with the production to parking information to social media campaigns. Perhaps you want to let patrons know about near by food options or pre-concert activities? Things to Know can be used for anything that improves your audience’s experience. How Are Arts Organizations Using It? 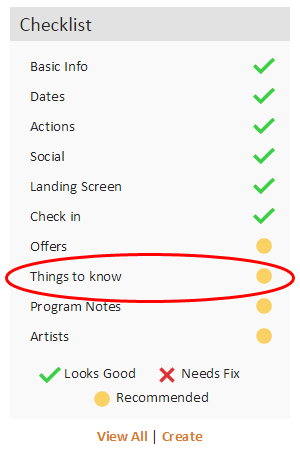 Step 1: Once you’ve created an At The Event instance, you will be greeted with a checklist showing you what features are available to you. Click on “Things to know” to get started adding your first item. Step 3: Here is where you add the important details. Be sure to include…. Once you have everything filled out, click “Add” and your first Thing to Know is done! You will be able to repeat steps 2 and 3 using the “Add Thing to Know” link until you have added everything you wish to include. You can manage your existing Things to Know by clicking the Name and making any needed edits. Re-ordering them can be done using a simple drag-and-drop method. To remove one completely, just click on the trashcan icon to the right.